Tang Contemporary Art Hong Kong is proud to announce the opening of Beijing Artist Zhao Zhao’s all-new exhibition “One Second • One Year” at H Queen’s. This is Zhao’s second solo exhibition with Tang Contemporary Art in Hong Kong after “Zhao Zhao” (2016). Curated by Barbara Pollack, professor of School of Visual Art, New York, this exhibition explores aspects of time and the way time alters our perception of the artworks on view. The heart of the exhibition are Zhao Zhao’s “One Second” drawings and “One Second” paintings, works that establish a dialogue about depictions of time. 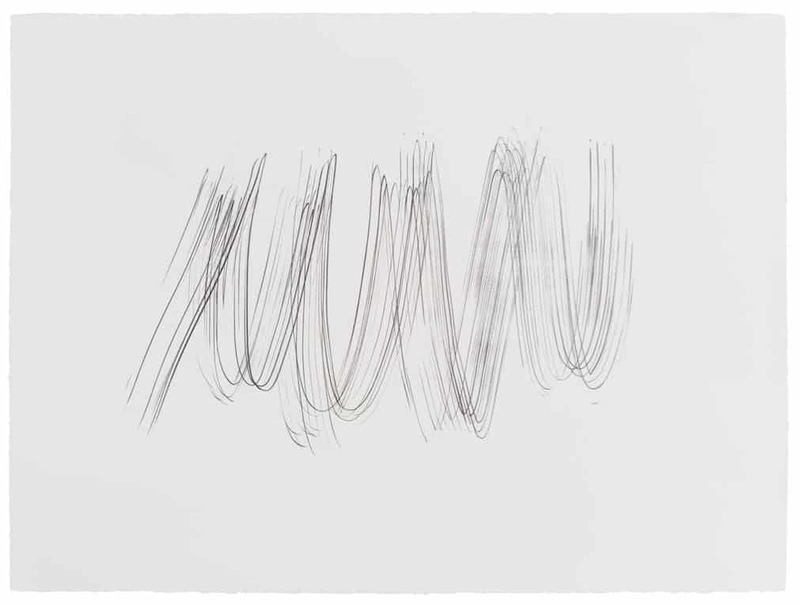 To create the “One Second” drawings, the artist held in one hand ten pencils and within one second marked a piece of paper with a grouping of lines. From these spontaneous works, he then went about meticulously translating the hyper-realistic image onto canvas in oil paints, a process that took almost a year to complete. The pencil drawings and the oil paintings instill different sensations in the viewer. The pencil drawings encapsulate a visceral loss of control where Zhao Zhao acts on subconscious motivations to make a set of almost violent markings on white paper. In contrast, the oil paintings evoke a meticulous process, employing the ultimate restraint to achieve a verisimilitude of momentariness. Zhao Zhao’s “Jade Constellations” add to the original Constellations by introducing a new element – circles of jade – into the holes in the glass. For about 5,000 years, jade has been the most precious element in Chinese culture, cherished by Imperial dynasties and adapted as a ritual object. To create these works, Zhao Zhao searched for jade elements at their source in Gansu Province, uncovering examples that were centuries old. By adding these jade circles or bi to his glass works, he is introducing the notion of time into the artworks, transforming them from spontaneous gestures into reflections on ancient rituals. Suddenly, the Constellations are no longer about contemporary politics but are also reflections on 5,000 years of history. In addition to the “Jade Constellations,” Zhao Zhao will include recent oil paintings and one tapestry on silk from the Constellations series. For the paintings, he has an uncanny ability to evoke the presence to shattered glass, even when we see we are staring at a canvas. In his typical use of Prussian blue on a white background, these paintings demonstrate his superlative skill as a draftsman, able to replicate any material in oil paints, no matter how complicated. Taking this practice to a new level, Zhao Zhao has added a new “Constellation,” in which the image of fractured glass is rendered in intricate embroidery on silk. So exacting is this rendition that, again, it can convince viewers that they are seeing splintered shards of glass when on closer inspection it is clear that the composition is comprised of minute stitches of thread. In these works, Zhao Zhao again reflects on the passage of time, using an image that had to be created in an instant as the basis for works that are durable and eternal. Contemplating these images, it is impossible to resist the notion that violence – an explosive disruption of time – may be an eternal condition, ever replicating itself in various manifestations every minute of every day. Or it could mean that even the most spontaneous act can be reevaluated and controlled, at least in the hands of a sophisticated artist. In either case, these are artworks of magnificent beauty, achieving stunning effects through the most painstaking process. At the minimum, we are in awe of Zhao Zhao’s achievement, ever contemplating the time it took for him to create these results. Born in Xinjiang, 1982, Zhao Zhao graduated from the Xinjiang Institute of Arts, 2003. All along Zhao Zhao was making work with a subversive appeal of its own, keens on raising challenges on the reality and its traditional practice of art form through a various art media. Zhao Zhao is known for making sculptures, paintings and installations which examine the power of individual free will and the dynamics of state control. Zhao Zhao’s works attest to and touch on the awareness of a generation faced with dramatic change. Constantly confronted with the subject of world oppression. His provocative, multidisciplinary artist practice has garnered him international attention in recent years, includes solo shows in galleries such as Alexander Ochs Galleries (Berlin, Germany), Carl Kostyál foundation (Stockholm, Sweden), Roberts & Tilton (Log Angeles, USA), Chambers Fine Art (New York, USA), Tang Contemporary Art (Beijing, China). He has received the support from many international institutions, among which are listed MOMA PS1 – The Museum of Modern Art (New York, USA), Tampa Museum of Art (Florida, USA), Pinchuk Art Centre (Kiev, Ukraine), Groninger Museum (Groningen, Netherlands), Museum of Asian Art (Berlin, Germany), Padiglione D’Arte Contemporanea (Milan, Italy), Premi internacional d’art contemporani diputació de castelló (Castelló, Spain), Minsheng Art Museum (Shanghai, China) and UCCA (Beijing, China). The Project Taklamakan of his was elected as the background picture of 2017 Yokohama Triennale Poster and catalog. At the same year, he was appraised as the award nomination of Chinese annual young artist in 11th ACC (Award of Art China) and one of Modern Painters “25 Artists to Watch”. A leading expert on Chinese contemporary art, Barbara Pollack is an award-winning journalist, art critic and curator. Since 1994, Barbara Pollack has written on Chinese contemporary art for such publications as The New York Times, The Village Voice, Art in America, Vanity Fair and Artnews, among many others. Her next book, Brand New Art from China: A Generation on the Rise, will be published by I.B. Tauris in September 2018. In addition to writing, Pollack is an independent curator who organized the groundbreaking exhibition, My Generation: Young Chinese Artists at Tampa Museum of Art, Oklahoma City Museum of Art and the Orange County Museum of Art in 2014 and WeChat: A Dialogue in Chinese Contemporary Art at Asia Society Texas in 2016. More recently, she curated Sun Xun: Prediction Laboratory at the Yuz Museum and Lu Yang: Delusional Mandala at the Museum of Contemporary Art Cleveland. She is a professor at the School of Visual Arts in New York and has been awarded two grants from the Asian Cultural Council as well as receiving the prestigious Creative Capital/Andy Warhol Foundation Arts Writers Grant.